Welcome to the archives of the classic yacht Amokura. 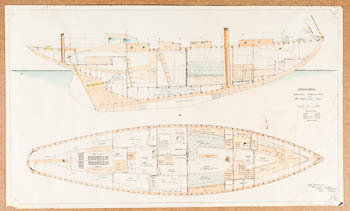 This site holds extensive archive materials including the original design plans for Amokura. Further materials will be added in the future – please visit again to check for updates, or subscribe via email to be notified automatically. Amokura was built in 1939 for Major (later Sir Ernest) Harston, ADC to Lord Mountbatten. Renowned designer Fred Shepherd designed her and supervised the build, which took place at the yard of AH Moody & Sons Ltd, at Swanwick in Hampshire, UK. She was later owned by the author George Millar who wrote extensively about her in his book Oyster River describing a summer spent cruising in the Gulf of Morbihan in the early 1960s. Amokura was later sold to Richard Carr, of the Carr biscuit family, who re-rigged her then sailed her extensively in the Mediterranean through most of the 1970s. In 1980 she was returned to Moody’s yard and her interior was stripped out to enable the structural beams to be reinforced and refastened. A new interior was installed under the direction of designer John Mumford and following relaunch Amokura was sailed to the Caribbean and the US East Coast. She returned to the Mediterranean before being brought back in the late 1990s to the UK for a refit at the International Boatbuilding Training College (IBTC) in Lowestoft. This included a light oak interior installed in keeping with her original construction. She spent the early 2000s cruising mainly in the UK before moving to the Mediterranean in 2007. In late 2012 Amokura sailed to Cockwells yard in Falmouth, UK for refit work including replacement of the deck. She then moved to Palma de Mallorca, Spain, before returning to Falmouth in 2015 for further improvement works with Butler & Co at Penpol, in Falmouth, UK. 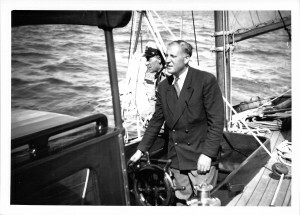 This included replacement of her wooden keel and a new wooden spars with a sail plan designed by the late Theo Rye. Amokura is now based in Falmouth, cruising the coast of Devon and Cornwall, with frequent trips to Brittany. Click on the menu above to access the archive materials. Please feel free to immerse yourself in the history of this classic vessel and if you have a historical link with Amokura or have archive materials you would like to share, please do get in touch using the contact page.